Works so well! Great gifts! I have bought several of these for family and friends . They work so well! All family members know at a glance whether the dishes in the dishwasher are clean or dirty. No more having someone put dirty dishes in with the clean dishes and having to wash them ALL again. Great product! I love this product. It is small and fits right on the dishwasher opening. Easy to slide from clean to dirty and back again. Let's everyone know what the status is on the dishes in the dishwasher. No more accidentally putting a dirty dish in the clean ones that I have not had a chance to put away yet. Great!!!! Looks like part of the diswasher! Makes for a happier wife therefore happy household! One of the best purchases ever, just wishes it wasn't as expensive for such a small, simple plastic piece. Yet even still, I have recommended it. I have it now have to remember to use it! It's just something I put on our dishwasher to let each other know if the dishes in it are clean or dirty. I have to remember to use it now!! It works just as it claims to! Keeps family from adding dirty dishes to a clean load. I have never used a better dish load indicator. Came with sticky backing that would be permanent on dishwasher. I used a strip of magnet (can buy at hobby store) with sticky backing and stuck them together. It now is a "magnet" that I can keep forever. This little thing went on easily. The slide was very tight the first few times we used it but it is getting easier to use. The only problem we have is remembering to use it. Stick it on the front of your dishwasher. That's all...easy to use. Prevents opening the door every time to check to see if the dishes are clean or dirty. I've looked for one of these for a long time! I'll order more, for my washing machine and clothes hamper, or any other useful place, such as garage cleaning cloth buckets for working on car. Thanks for making this available. Having two side X side dishwashers, these alleviate the problem of having dirty dishes in with the clean. Work perfectly. Great little sign/reminder. It works manually, you just have to make sure you switch the level, either to clean or dirty-although, sometimes i still forget to do this, lol. This has a sticky backing so can be applied anywhere on your dishwasher & stays permanently! You just slide back & forth over the description that does not apply at the moment. I have been using these for years, so this is a my most recent re-order. This is not a magnet; it sticks securely with double-sided tape. When I bought a new dishwasher, I could not pry off the old one without breaking it, so it also went to be recycled! Also great if you have children or guests in the house so everybody knows what's clean or dirty! It is such a simple thing but it makes all the difference. No more opening the dishwasher door to see if the dishes are clean or dirty. I love it. Years ago I wondered how to solve this problem ,this is a great solution ! Totally beats taping a "CLEAN DISHES " sign on the dishwasher! I'm totally lovin this idea . cleaning the kitchen. Now we don't have to question whether dishes are clean. Just had to get used to switching it when I started the machine. No more double washing when my husband put dirty dishes in with the clean! I would buy this again just what it says it is perfect size! Nice size not huge so it doesn't stand out. Very pleased. Has double faced tape on back that securly holds it in place. love it as it does help me with cleaning the dir ty dishes nd not rewashing them by mistake. Fit right on the dishwasher. Easy to see and to read. Now I just have to teach my husband to check the sign before asking the question. 43 years and still a work in progress. People no longer need to ask. I purchased one for myself, one for my sister and one for my three daughters. We all just love them and they look so neat on the dishwasher. I just love this reminder of clean or dirty dish reminder. I also bought another one for one of my sisters. And she is enjoying it. As we get older it is harder to remember if the dishes have been washed or not. Knowing at a glance if dishes are clean or dirty. Just bought another one for expected move soon. Gadget does its job. When the "clean" is visible, I do not add dirty dishes anymore! this handy little reminder is a gem for my dishwasher usage. It lets the whole family know for sure if the items in the washer should be used or not. Also helps my memory out on when I last used the washer. Had used a "homemade sign" very similar to this, and it kept falling off the dishwasher! This is an indicator to tell you when the dishwasher has dirty dishes in it or it has clean dishes in it. It is great to have because you will never have to guess if the dishes and glasses in the dishwasher are clean or not. This is great for someone like myself, that forgets things easily. 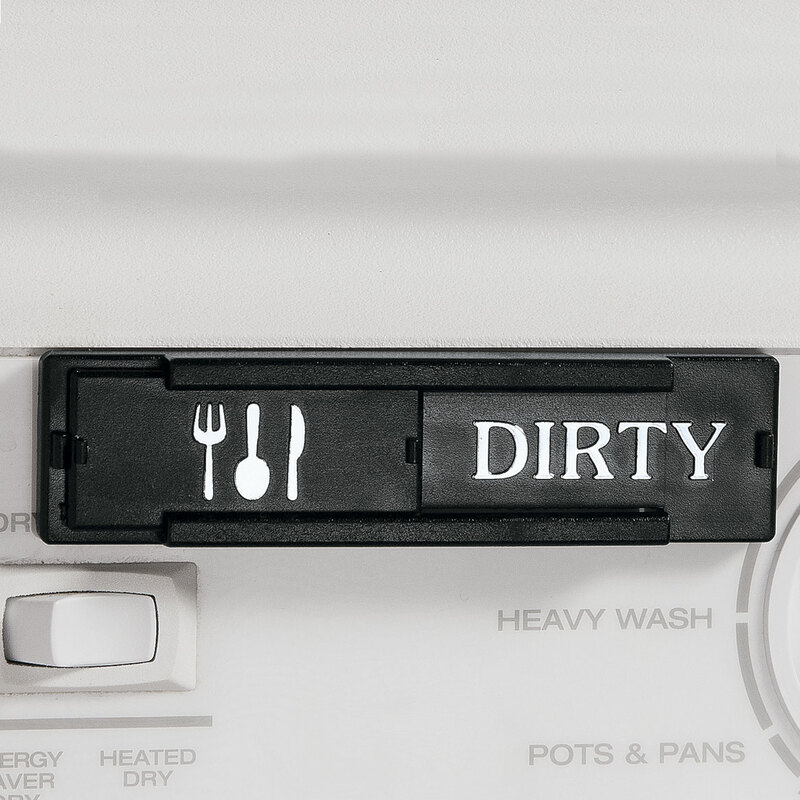 Lets you know when the dishwasher is clean or dirty. You have to manually change it, so I change it to clean while the dishwasher is on and dirty when I unload it. It sometimes slides into the middle, but is very easy to reset. Mom and I share a house and always forget to tell each other wjether or not the dishs in the dishwasher are clean or are dirty and sinxe we don't eat together often this is important. Was always wondering if dishes were clean or dirty. Now just shift the sign when you run the dishwasher and again after unloading. Glad I got this item!! I love it, now I don't have to leave a note saying the dishes are clean! It looks great. And it's a perfect size. I would definitely buy again. Lets you know who's turn is next. I have had one of these for a long while. I just ordered a replacement for me and also one for my daughter. So often , we ask each other, is the dishwasher dirty? and great usable gift !!! Keeps dishes from being washed a second time when you can't remember if you put the dishwasher on! I am over 70 and tend to forget. I love this as a reminder that my dishes are clean or dirty. I actually ordered some for other people. No more confusion whether the dishes are clean! With three adults in the house, we are constantly using the dishwasher and always asking, "are these dishes clean or dirty?". Not anymore! Nice size for dishwasher. Adheres very well to surface. Eashy to read. I really like this product. Ordered and received one for my daughter but misplaced it. It is small. This gadget fastened in a jiffy, and is right there to change easily. It can be seen easily and slides freely, and works a lot better than my former popsicle stick. Works great easy to install and use. It is easy to install and also kid proof compared to a magnet version. With 3 cooks in the kitchen we all know when we can empty the dishwasher. I live alone so frequently I don't bother to immediately empty the dish washer. This reminds me so that I don't end up putting dirty dishes in with the clean. It would be easy because I always rinse food off the dirty before putting them in the washer so they might appear clean. It is big enough to be easily visible above the middle of the handle yet is unobtrusive when I want to clean the door. Love it. Some reviewers don't like that this is not magnetic. I wasn't sure when I got it that I would either, but it's now been three years, and the adhesive has held on perfectly, despite the fact that it gets quite hot from steam vents. I now prefer this to the magnetic kind that can easily get knocked off. The slide works perfectly, and I like that it looks very classy, not cheesy like some I've seen. It still looks and works like brand new, with three years of daily use. I am ordering another one for my next house! This neat little gadget is very useful in my busy kitchen. My first one lasted about two years, and I'm back for another. This reminder is the very first one that I found that will adhere to a plastic dishwasher door - all the other ones had to be placed on something metal for the magnets to cling to - therefore inconveniently "out of sight." I love this one -it's attractive and works every time with it's easy-to-use slide operation. Love it. Set to clean when you turn on to wash and set to dirty when you unload. Hubby can tell if dishes are Dean or dirty. This is a hard to find item. Helps to identify if clean or dirty. I live alone and only use my dishwasher about once a week. I don't always unload immediately afterward either. I have a hard time remembering whether the dishes are clean or dirty. I had been using a sticky note, which gets expensive one after the other. So I bought this and put it onto my dishwasher and LO I am saved! No more sticky notes! I Love it!!! No more guessing. As we get older you will start to forget things. No more putting dirty dishes in dishwasher with clean ones; I'm happy with this solution. Applies easily, can be used without magnets! A great reminder helps you not to put dirty dishes into a clean batch which I did before I purchased the wonderful sign. This works so well. No more teenagers throwing dirty dishes on top of clean ones in the dishwasher! No more of them putting dirty dishes in the sink instead of the dishwasher because they "thought the dishes in the dishwasher were clean." Wish I had bought one years ago! 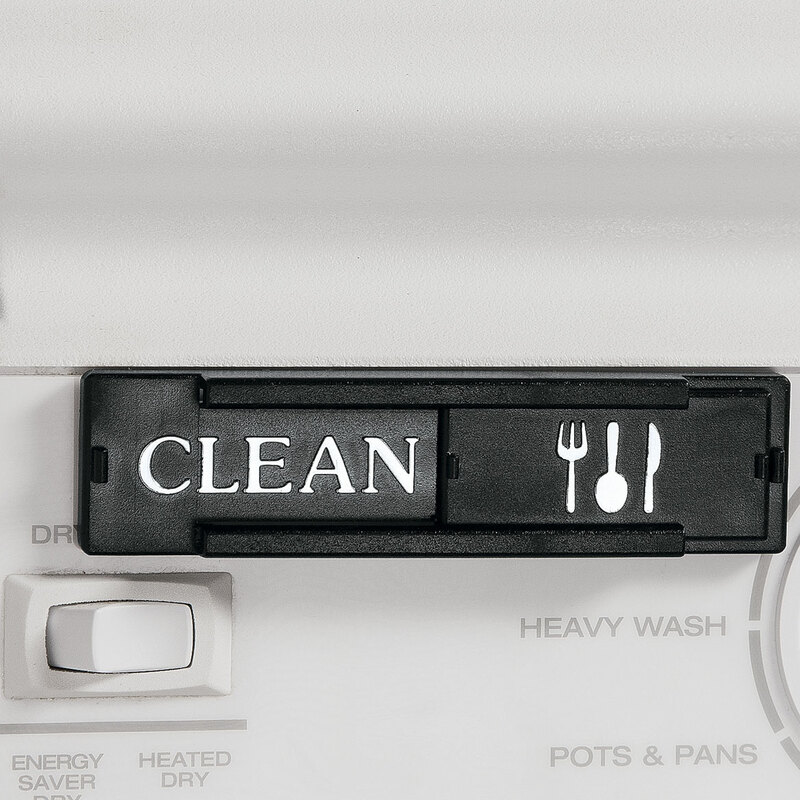 It is so nice and very easy to switch as you turn on the dishwasher to run, just switch to clean!! Easy as that! Perfect!!!! I love my dishwasher reminder magnet. I use it all the time and it comes in very handy. Perfect size, perfect product. I love this little dishwasher alert. It keeps my husband from getting out dirty dishes in the dishwasher and reusing them especially silverware. looks good on my dishwasher. My dishwasher has not magnetic surfaces so this works great. Looked for this product for years. So happy to have finally found it. Thanks Miles Kimball!! As soon as I unload my dishwasher I slide the sign to dirty. My whole family loves it because they know when the dishes are dirty and when they are clean. I always rinse the dishes before placing them in the diswasher so my family depends on the sign to let them know if the dishes are clean or dirty. I could not do without this gadget I simply love it. I intend to buy more to keep and to give as small tokens to family and friends. Like the way it stays in place and you just slide the bar. Doesn't scratch the paint on the dishwasher, or get knocked off easily. Easy to read. A sure fix to the (? ?IS IT CLEAN OR DIRTY??) issue that comes with using a dishwasher. The new problem now is getting ppl. in my home to use it, that's a problem i have to fix! ha ha Only complaint i have is it's a little hard to slide and price could be a little cheaper for a simple plastic item. Makes a great gift idea for anyone that uses a dishwasher! I use my Dishwasher Reminder all the time. Gave one as a Housewarming Gift, to a lady who now has a dishwasher. She was thrilled. The product is nice. It needs to be a magnet though. I didn't realize it wasn't until my husband already put it on the dishwasher. It has a very good sticky back, once you stick it, it's pretty much there to stay. Just stick it on the top of the door for all to see and watch the positive comments. I have bought these now for 3 homes. It certainly reduces arguments with others in the house. Kudos to whoever made this little inexpensive helper! I liked this product so much that when the old one broke I brought another one. It is great at keeping clean and dirty dishes from getting mixed up. We had to rid ourselves or our unusable dishwasher, that had the "clean/dirty" label on it. My husband immediately started to mix clean an dirty dishes. So we had to get a new one. Thank you for still selling them. No more mixups! Ive been wanting something like this for a long time!! You will appreciate having this item. We had to have this with three people in our house that uses our dishwasher. Now there is never any question as to where the last person left off. I was looking for a dishwasher alert magnet but this stick-on seems to be ok. I hope it stays on through the heat cycles. Now we'll know if we have clean or dirty dishes once the door is unlocked. Finally! This is a life-saver! Love it! I use these products on dish washing drawers. It is a bit hard to see the one I stuck on the bottom drawer. I'm glad to find them though. I've looked for them for a long time. With this gadget you know if your dishes are clean or dirty. The choices don't fit the product! I use it to assist family members who cannot tell if dishes are clean or dirty in the dishwasher. I did not like that it glues on to the dishwasher so I add a strip of magnetic tape so that I can remove it when I wipe down the front of my dishwasher. This item is easy to use, read and operate. Anyone who can read will get the message. It is small, does not get in the way. I just worry about cleaning it so it will not hold food particles. Also to think of a way to adhere it if or when the sticky comes off. I also like it because it was made in the USA! Finally a dishwasher clean/dirty dishes sign that is easy to use. I didn't read the description very well as I thought it was a magnet. It sticks on the dishwasher and that isn't what I wanted but it works very well. Easy to read and easy to use. My husband is always asking if the dishwasher is clean or dirty. 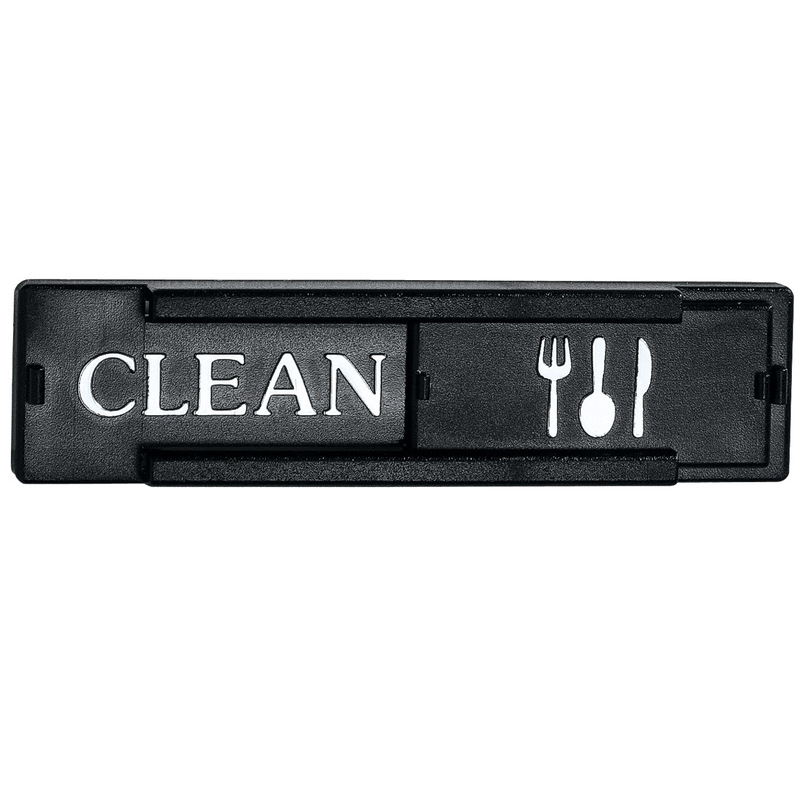 I was looking for a black slide dishwasher reminder and fell in love with this simple style. I have some small 19mm round magnets on hand so I a fixed one to each end of the adhesive and cut the paper backing to stay in the middle. This worked like a charm. I can remove the dishwasher reminder as needed. It is easy to slide and the metallic lettering makes it easy to read from a distance. Hopefully my husband will take initiative to empty the dishwasher when clean now. Costly but does the job. It works well on stuck to the dishwasher. This dishwasher reminder is good, it's much better than the little green light on the dishwasher. The only fault is the words clean and dirty should stand out just a little more that what they do, but I'd buy it again. Does serve a purpose. Way overpriced for a little piece of plastic. Should sell for no more than $1.99. Another use might be for autos using both E-85 fuel and regular fuel. Can't always remember what fuel I'm running and can't add alternate fuel unless I'm down to a certain level. This way I don't have to guess what fuel I'm current running on. Just place E-85 and regular stickers over clean / dirty and attach. No one asks if the dishwasher is clean or dirty anymore, they just look at the alert sign. I wish it was magnetic instead of taped on, however. I was hoping that this had a magnet, but instead you have to actually peel off the backing and permanently affix this to your dishwasher. It's not that bug of a deal, but I wasn't expecting that. Otherwise it works great and slides back and forth to show "dirty" or "clean." It's unobtrusive and not some cutesy item. I like it! i KNOW IF MY DISHES ARE CLEAN OR DIRTY. A "little" thing to make life easier! The hardest thing about using it is to remember to change it back and forth! I thought it was a magnet, so like Grandma P I will stick magnets to the sticky strip so I don't get goo on my dishwasher. Plus, I use full coverage scene magnets that cover the whole front of my dishwasher that I change frequently. This item makes it a lot easier for everyone in household to know for sure if the dishes are clean or dirty in dishwasher. Easily read from anywhere in the kitchen. Mounted it the day it came and use it all the time. I put this reminder on my dishwasher and now we are never wondering if we ran the washer or not. We just slide the reminder when we fill the dishwasher and run it. Purchased this for my my son and family, they don't have a magnetic dishwasher front so they have been searching for a self stick sign. This item is inconspicuous, looks like it's part of the dishwasher and helps identify the status of items in dishwasher so there isn't confusion between family members. The only issue is it could be a bit easier to slide back and forth for younger kids. No more opening the dishwasher door to see whether the dishes are clean or dirty. connects to the dishwasher and shows whether the dishes inside are clean or dirty. I glued three small magnets on the back and it stays on the dishwasher without having to mar the surface with the sticky back. It is what it is. Not really pretty. Wish it could slide by itself... otherwise, it does what it's supposed to do. Not a magnet but a permanent stick on. If I had known this, I would not have bought it, so please note: It is stuck on forever, not a magnet. Otherwise, very nice, but a bit small. Have been hunting these for ever. Wonderful when there is more than one person living in the house. I like this little reminder. I've been looking for something inexpensive like this for a long time. I would have given it 5 stars if it were magnetized and not stick-on. This works but it is difficult to slide it from side to side. I'm hoping it loosens up some when it gets used more. Can't see what you need to! sticks great but you can!t see it unless your on top of it. Would not buy again and I waited for months for this to re-appear in the catalog.. The dishwasher alert is black like my dishwasher so it blends in well. I did have to stick a strip of magnet tape on as I did NOT want to tape it directly on my machine as it it designed for. It worked really well! Still trying to get use to having it. Suggest mounting it below the hand on lighter color to make it more noticeable. FOR PROPER USE OF THIS ITEM IT WOULD HAVE TO BE ALEAST 4 TO 5 TIMES IT'S SIZE. IT IS TOO SMALL. COULD BE USED AS A CHILDS TOY. OVER RATED AND OVER PRICED. IT IS WORTH NO MORE THAN 50 CENTS. Not aware that this was not magnetic. Very poorly designed. I like this design. Have never seen this style before. To give to someone buying a new house. I have always loved mine, and like to give for gifts. I have one and many members of my family have one. It is most convenient and useful. Never have any question about whether dishes are clean or dirty. chosen to help family members who didn't do the dishes know if they are clean or not. I have one and have bought them for my grown children. My sister just had her kitchen remodeled and said she wish she had one. I bought a few extra for when me or the kids need a new dishwasher. It helps everyone know if they can add dirty dishes or need to empty it. Because I like it and give it to friends who need one. Actually, it is so that I can tell if the dryer lint filter has been cleaned or not. It's a PITA to get down on my knees and check. So when my husband adds something into the dishwasher he can tell if the dishes are dirty or clean. I purchased this for myself, and my daughter wanted one so this one is for her. Because I have wanted one forever, and this is the first one I have come across. So I bought it. I like to be reminded that I've already ran the dishwasher. I needed a sign to let everyone know when dishes are clean or if they are dirty. I never can remember what cycle the dish washer is on, this will help. Need a way to know the status of my dishwasher. Because it would be helpful with determining whether dishes have been washed or not. I like that it sticks to the dishwasher and slides back and forth. I don't want to have to turn it over just to know if it's clean or dirty. A simple slide is much more convenient. My dishwasher door is not magnetic and the fact that I can stick this on is great. Because I can't remember which is which! So my family knows if the dishes are clean or dirty. Hard too find, glad they had them. I have given to several family members years ago and they keep asking me for new ones. I have had one like this before and I really like it. I wore the lettering off the last one. I've used this for years. I love it! Now I'm moving and need a new one. I've had one before and I wore it out! I ORDERED THIS A WHILE BACK WHEN I PURCHASED MY NEW DISHWASHER, I LOVE IT. MY SISTER ASKED ME ABOUT IT BECAUSE HERS IS A SIGN THAT YOU FLIP BACK AND FORTH, THE PROBLEM SHE HAS IS THAT WHEN YOU OPEN THE DOOR TO GET SOMETHING THE SIGN CAN CHANGE EVEN THOUGH YOU DIDN'T EMPTY IT, OR THE SIGN HAS FALLEN OFF LEAVING YOU TO GUESS IF THE DISHES ARE CLEAN OR DIRTY. YOU WONT HAVE ANY PROBLEMS WITH THIS ONE. Family puts all dishes in sink instead of opening dishwasher to check if it is clean or dirty. How does it stick to the dishwasher? BEST ANSWER: It has a self-sticking tape on the back, works very well. Stays put and you just slide the words from dirty to clean or vice-versa.